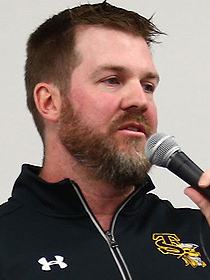 The 2018-19 academic year will be Salbato’s fourth year as the Director of Athletics at Trinidad State Junior College. Salbato assumed the Director of Athletics role in the spring of 2015. Prior to becoming the AD he served for two years as Assistant Athletic Director/Sports Information Director to Coach Rich Holden. In the past few years the college athletic department added programs to its valley campus in Alamosa. Cross Country and Track & Field were the latest additions to the programs TSJC competes in with other NJCAA schools. This past year was another banner year for Trinidad State as they had 23 NJCAA All-American awards and 40 NJCAA Academic All-Americans. Salbato, a native of Trinidad, graduated from Trinidad State in 1994 and immediately started working in the Audio-Visual department under current Director of Technology Doug Bak. Salbato performed various jobs in the IT department, before being assigned the Sports Information and Web Developer duties in 2005. He earned his bachelor’s degree from Colorado Christian University in the summer of 2014 and followed that up with a masters from Coker College in the winter of 2015. Salbato and his wife Melissa reside in Trinidad and have three children, Mara, Myka and Mason. In his spare time Salbato works for KCRT Radio in Trinidad as their sports announcer.